What a fantastic service..I have a boxer and two Boston's they are incredibly spoiled and we didn't want to board them..so we had the pet sitters come to our rv and watch them...they pampered them like they were their own...how nice not to have to board them and go through all of the hassle...wish I could give them more than five stars !!! We had a great experience with My Trusted Pet Sitter of Naples. Leonard, the owner, goes the extra mile to make sure that his pet and people customers are happy. We used him for a 2 wk. vacation and he would text us a picture of our little girl (Zena) persian with a nice note every day and sometimes twice per day. Our kitty seemed to not even notice we were gone as she acted like she didn't miss us at all. That is such a good feeling to know that she got the love and attention she is accustomed to. 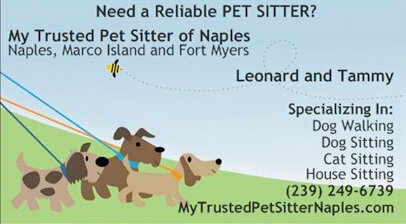 If you are looking for the best pet sitter in Naples please use Leonard as he will do all of what you ask and will go the extra mile to make it all a great experience. We are now using him again this week for another vacation. Thanks so much Leonard for providing us the peace of mind we needed. Our baby means the world to us and your love and attention also are greatly appreciated. "Thanks so much for watching our cat on such short notice. We were pleasantly surprised to also find that you cleaned the litter box and any stray litter around it that tends to fall on the floor. You left kitty's area and our home better than when you first checked on her (yes, we noticed and really appreciate your attention to detail). Thanks again and we will let you know next time we're out of town on an extended trip." Really happy with My Trusted Pet Sitter of Naples. Reliability is of course critical when it comes to our pets and they do exactly what they said they d do, when they say they d do it. I definitely recommend them whether you are out for a short trip or an extended trip. They will also txt you a photo of your pet(s) during each visit if you want, at no additional charge. I love that peace of mind! I was so pleased with the care my dog received from this company while I was away for 3 long days. The cost was comparable to what I was previously paying but the care she received from the family exceeded my expectations. Thanks for caring so much! L.N.W. "Great job with my 3 dogs. I know they are a handful and a half! Sorry my trip took me away for an extra day. Your 'no problem I will make sure they are taken care of for however long it takes you to get back' attitude is exactly the type of person I like to do business with. Might need your help again in a couple of months, will let you know."